A celebration of political activism by America’s youngest citizens–our children. You’re never too young to care about your community or to stand up for your beliefs. That’s the empowering message of this book, which is all about how real kids exercise their first amendment rights. 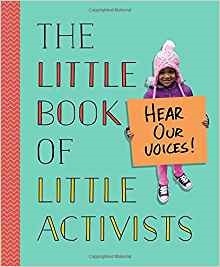 Filled with inspiring photos of children at recent demonstrations and rallies, The Little Book of Little Activists also includes inspirational quotes from kids themselves on topics of equality, diversity, and feminism, as well as an introduction by Bob Bland, co-chair of the Women’s March on Washington, and an afterword by civil rights activist Lynda Blackmon Lowery, author of Turning 15 on the Road to Freedom: My Story of the 1965 Selma Voting Rights March. Five percent of gross proceeds go to benefit the Children’s Defense Fund. The Little Book of Little Activists is a child’s very first introduction to political activism, presented at a level that they can understand and relate to. Perfect for parents who want to raise their kids to become participatory members of a democracy.